The William G. Pomeroy Foundation is kicking off 2019 with a redesigned website at wgpfoundation.org that offers a new look and feel, with streamlined navigation, fresh content and several new features. 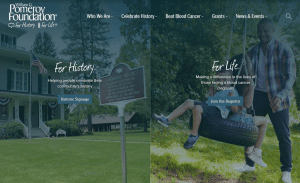 The Pomeroy Foundation, a private, grant-making foundation, has two main initiatives: helping people celebrate their community’s history and making a difference in the lives of those facing a blood cancer diagnosis. The Foundation’s new website was built by The Lab Creative, a Syracuse-based design studio. For information about the Pomeroy Foundation’s historic signage grant programs, click here. To learn more about joining the bone marrow registry, click here.